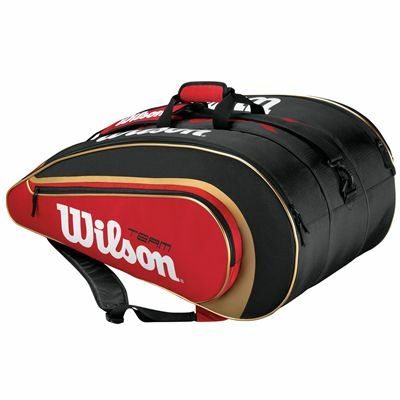 The Wilson Team II BLX Super Six racket bag features three main compartments with easy access curved openings and two large side accessories pockets. The bag provides a padded, removable shoulder strap with speed clips, backpack straps and two-piece centre carry handle ensuring comfortable transportation. The bag can hold 6 rackets and expands to hold up to 12 rackets. It is 30” (76cm) long, 18” (46cm) wide and 13.5” (34cm) high. for submitting product review about Wilson Team II BLX Super Six Racket Bag.